Along with Dr. Alain Deschamps (principal investigator), Dr. El-Gabalawy, Dr. Eric Jacobsohn, Dr. Tarit Saha, and Dr. Michael Avidan (co-applicants) were successful at obtaining a Canadian Institutes of Health Research Project Scheme Grant valued at $765,000 for their work titled "Electroencephalography Guidance of Anesthesia to Alleviate Geriatric Syndromes (ENGAGES-CANADA) Study in Cardiac Surgery Patients: a Pragmatic, Randomized Clinical Trial". Dr. El-Gabalawy will play a primary role in investigating secondary aims focused on perioperative mental health, namely post-traumatic stress disorder. Another great year at the Anxiety and Depression Association of America (ADAA) conference! Blaney, C., Sommer, J.L., Beatie, B., Bilevicius, E., Kilborn, K., Chang, U., Mota, N., Sareen, J., El-Gabalawy, R. Dissociation in the context of posttraumatic stress disorder and borderline personality disorder: Associations with traumatic event type and quality of life. Blaney, C., El-Gabalawy, R., Bernstein, C., Walld, J.M., Sareen, J., Patten, S.B., Singer, A., Lix, L.M., Hitchon, C.A., Katz, A., Fisk, J.D., Marrie, R.A., Incidence and temporal trends of comorbid personality disorders in inflammatory bowel disease, multiple sclerosis, and rheumatoid arthritis. Sommer, J. L., Mota, N., Edmondson, D., & El-Gabalawy, R. Comorbidity in illness-induced posttraumatic stress disorder versus posttraumatic stress disorder due to external events in a nationally representative study. Sommer, J. L., Blaney, C., Beatie, B., Bilevicius, E., Kilborn, K., Chang, U., Mota, N., Sareen, J., & El-Gabalawy, R. Dissociation in posttraumatic stress disorder and borderline personality disorder. Sommer, J. L., Reynolds, K., El-Gabalawy, R., Pietrzak, R. Mackenzie, C. S., Ceccarelli, L., & Sareen, J. Medical conditions associated with posttraumatic stress disorder across the adult lifespan. Bilevicius, E., Sommer, J. L., Asmundson, G. J. G., & El-Gabalawy, R. Posttraumatic stress disorder and chronic pain conditions are associated with opioid use disorder: Results from a nationally representative survey. Bilevicius, E., Sommer, J. L., Asmundson, G. J. G., & El-Gabalawy, R. Comorbid relationship of posttraumatic stress disorder and chronic pain conditions on marijuana misuse and use disorders: Results from a nationally representative study. Congratulations to Edward Noh who was awarded a Statistics Canada Research Data Centre scholarship for his BSc(Med) project examining rates and implications of surgical cancellations in Canada. Way to go Edward! BSc Med Students from the HatLab clean up in awards! Everett Vun, supervised by Dr. El-Gabalawy, received the A. Allyn Rossen Award for the Best BSc(Med) project, the Schom Travel Bursary Award to present her findings in Texas this April, and the Dr. James E Wilson Memorial Award for outstanding promise in research. Her project was titled "An Examination of Chronic Pain and Mental Health Conditions in a Population-Based Survey of Active Canadian Forces Personnel". Joel Braun, supervised by Dr. Natalie Mota (secondary supervisor: Dr. El-Gabalawy), received the BSc(Med) Program Award for an Outstanding Clinical Research Project. His project is titled "Trauma exposure, DSM-5 posttraumatic stress disorder, and binge eating symptoms: Results from a nationally representative sample". Dr. El-Gabalawy and Dr. Brigitte Sabourin, as co-principal investigators, were awarded an HSC Foundation grant for $70,000 for their project titled, "Improving access to pain interventions for patients with chronic pain through a web-based program – “Managing Pain: Tools for Life”. Co-investigators include: Dr. Ryan Amadeo, Dr. Lesley Graff, Dr. Jessica Senn, Dr. Barbara Shay, Dr. Ryan Skrabek, Dr. Gregg Tkachuk, & Dr. John Walker. The HATLab is fortunate to be working with a fabulous multidisciplinary team! Jordana Sommer was awarded a Canadian Institutes of Health Research Canada Graduate Scholarship (Master's) and a top-up from the Faculty of Graduate Studies at the University of Manitoba. She also won the Canadian Psychological Association Academic Excellence award and the Ten Have Award for the best undergraduate Psychology thesis. Her thesis was titled "Maladaptive Eating Typologies and Associated Medical Condition Correlates in Post-Traumatic Stress Disorder". Way to go Jordana! Dr. Brian Csupak was awarded a Statistics Canada Research Data Centre award for his Anesthesia research project titled "An Examination of the Co-Occurrence and Correlates of Chronic Pain and Generalized Anxiety Disorder in the Canadian Population". Go Brian! Dr. El-Gabalawy (on right) and Dr. Natalie Mota (on left) co-chaired a symposium titled "PTSD and Physical Health: New Directions in Understanding this Complex Relationship". Dr. Kathryn Magruder (center) from the Medical University of South Carolina was the discussant and provided exceptional insights. Jordana Sommer and Everett Vun attended and presented their work at the Anxiety and Depression Association of America conference. They both were awarded generous travel funding from the University of Manitoba, and presented first authored posters. Family Practice News featured Dr. El-Gabalawy's talk on illness-induced PTSD. Dr. El-Gabalawy and Dr. Jennifer Kornelsen, as co-principal investigators (co-investigators: Dr. Eric Bohm, Dr. Gordon Asmundson, Dr. Corey Mackenzie, Dr. Heather Macdonald), were awarded the University of Manitoba Collaborative Research Program grant for $25,000 to examine pre-operative mindfulness-based stress reduction on post-operative total knee arthroplasty health outcomes. The HATLab is looking forward to the Anxiety and Depression Association of America conference in April 2017 in San Fransisco, California. Along with Dr. Natalie Mota, Dr. El-Gabalawy will be co-chairing a symposium titled "PTSD and Physical Health: New Directions in Understanding this Complex Association". She will also be presenting a paper within this symposium titled "Illness-Induced Post-Traumatic Stress Disorder: A Population Based Investigation". Congratulations to Jordana Sommer who had two projects accepted as poster presentations, and Everett Vun who also had her project accepted as a poster presentation. Kirby Magid and Dr. El-Gabalawy at the International Society for Traumatic Stress Studies in Dallas, Texas in November. Kirby's poster was endorsed by the Aging, Trauma, and Life Course Special Interest Group and was featured at the welcome reception. Congratulations, Kirby! Magid, K., El-Gabalawy, R., Maran, A., & Serber, E. (November 2016). An examination of post-traumatic growth and its correlates in a sample of outpatients with cardiac disease. Poster presented at the 32nd Annual International Society for Traumatic Stress, Dallas, TX. 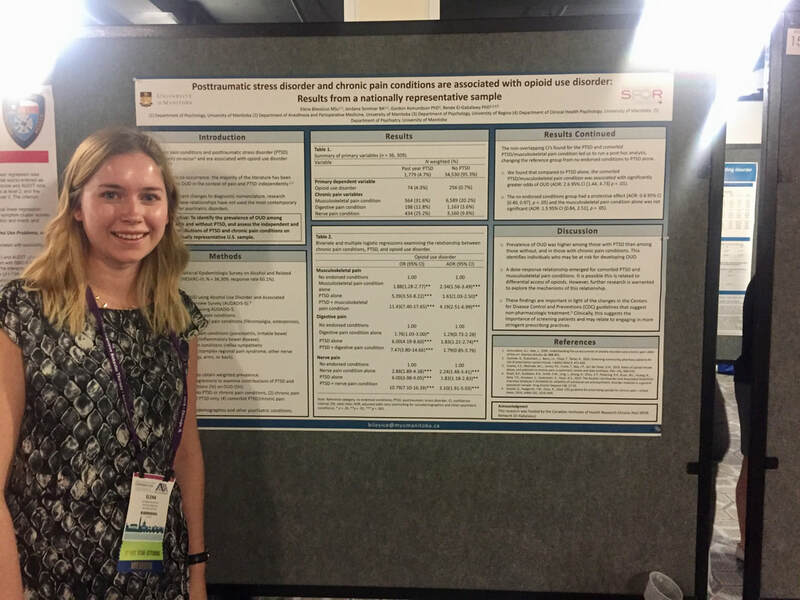 Caitlin Blaney presented her dissertation proposal at the Arthritis Alliance of Canada Conference and Research Symposium in Montreal, Quebec in October 2016. Caitlin's PhD research is funded by The Arthritis Society and a University of Manitoba Graduate Fellowship. Blaney, C., & El-Gabalawy, R. (2016, October). Investigating the relationship between anxiety and rheumatoid arthritis on disease severity and complexity. Poster presented at the Arthritis Alliance of Canada annual meeting: “Translating arthritis: Knowledge to action for Canadians". Montreal, QC. Read about Caitlin's research here. Everett Vun presented her BSc(Med) project at both the University of Manitoba Undergraduate Research Symposium and the Anesthesia Resident Annual Research Symposium. Vun, E., Turner, S., Mota, N., Afifi, T., Sareen, J., & El-Gabalawy, R. (2016, November). An examination of chronic pain conditions and mental health correlates in a population-based survey of Canadian Forces personnel. Poster presented at the University of Manitoba Undergraduate Research Symposium. Winnipeg, MB. Vun, E., Turner, S., Mota, N., Afifi, T., Sareen, J., & El-Gabalawy, R. (2016, November). An examination of chronic pain conditions and mental health correlates in a population-based survey of Canadian Forces personnel. Poster presented at the Anesthesia Annual Research Symposium. Winnipeg, MB. El-Gabalawy, R., Bernstein, M., Mackenzie, C., Sareen, J., & Hitchon, C. (2016, November). The impact of mental health indicators of disease severity among patients with inflammatory arthritis: A cross-sectional and longitudinal investigation. Paper presented at the American College of Rheumatology Annual Meeting, Washington, DC. Findings from this study were featured in Arthritis Digest and Healio Rheumatology. El-Gabalawy, R., Bernstein, M., Mackenzie, C., Sareen, J. & Hitchon, C. (2016, November). Anxiety sensitivity on indicators of disease severity among patients with inflammatory arthritis. Poster presented at the American College of Rheumatology Annual Meeting, Washington, DC. Mac Donald, K., & El-Gabalawy, R. (2016, November). An examination of pre-operative distress on perioperative factors in non-cardiac surgery patients. Poster presented at the Anesthesia Annual Research Symposium. Winnipeg, MB. Hoban, C., Mutch, A., & El-Gabalawy, R. (2016, November). A comprehensive evaluation of pre-surgical factors on post-operative delirium: A pilot study. Poster presented at the Anesthesia Annual Research Symposium. Winnipeg, MB. Csupak, B. & El-Gabalawy, R. (2016, November). An examination of the co-occurrence and correlates of chronic pain and generalized anxiety disorder in the Canadian population. Poster presented at the Anesthesia Annual Research Symposium. Winnipeg, MB. Along with primary co-investigator, Dr. Tom Mutter, Dr. El-Gabalawy received a Department of Anesthesia Operating Grant for a study entitled "A retrospective cohort study of oncologic, medical, and mental health-related correlates and outcomes of breast cancer surgery". Congratulations to Caitlin Blaney who was awarded the Arthritis Society Training Award to support her PhD studies! 2) Congratulations to Caitlin Blaney for receiving the University of Manitoba Graduate Fellowship to support her PhD! As principal investigator, Dr. El-Gabalawy received two University of Manitoba Anesthesia Operating Grants to fund research pertaining to (1) neurological and neuropsychological abnormalities predicting post-operative delirium and, (2) understanding the relationship between anxiety, indicators of severity, and chronic pain in rheumatoid arthritis patients. Congratulations to Everett Vun and Joel Braun who were accepted into the BSc(Med) program for 2016 and 2017!